Ogata drives a Red FD3S. That's all in my mind now. Haaaah. What!!! So I recently found out from a fellow 3000 friend that the 3000 has already been in Initial D! It's from the Team Spiral episode. Image size reduced, original size: 1134 x 588. Click here to view the image in its original dimension. Yep, the GTO 3D model's been in since at least Wangan Midnight, though it may have been featured before in as early as Third Stage. The SVX was the same way. Poke through the series, I'm sure you can find much earlier examples. Licensed or not I just have to share this. Old I know. But hey, I'm a slowpoke. What do you expect? Holy cow! 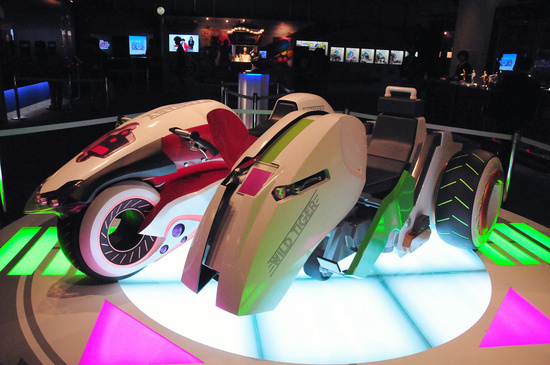 A REAL LIFE SIZED VERSION OF THE DOUBLE CHASERS FROM TIGER&BUNNY! ARGH I want. If they really run too, that would be awesome! That looks so cool! Especially the part on it that says "no hotlinking"! 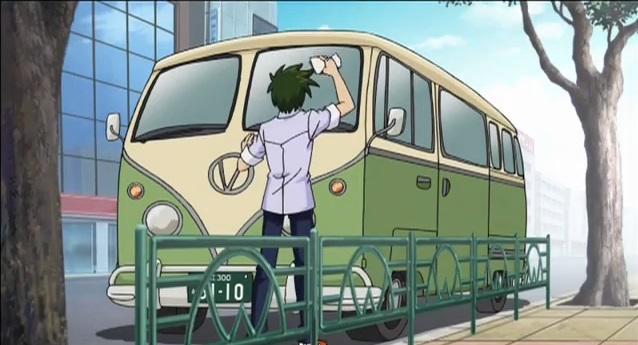 And in Ken Akamatsu's new manga, UQ Holder!, there's a BUNCH of Mercedes Benz that appear in one chapter including an old 600. The pink haired character is the one of the teachers at the main character's school. Image size reduced, original size: 952 x 489. Click here to view the image in its original dimension. Image size reduced, original size: 941 x 523. Click here to view the image in its original dimension. Image size reduced, original size: 945 x 528. Click here to view the image in its original dimension. Image size reduced, original size: 943 x 527. Click here to view the image in its original dimension. Image size reduced, original size: 949 x 530. Click here to view the image in its original dimension. Image size reduced, original size: 951 x 535. Click here to view the image in its original dimension. Image size reduced, original size: 852 x 468. Click here to view the image in its original dimension. Image size reduced, original size: 828 x 598. Click here to view the image in its original dimension. Reposting the Dai Mahou Touge AE86. Image size reduced, original size: 842 x 472. Click here to view the image in its original dimension. Image size reduced, original size: 811 x 1081. Click here to view the image in its original dimension. What i like in this one it's when they have to escape to K♠, the vehicle change. There's no magic in this one. Image size reduced, original size: 1841 x 1403. Click here to view the image in its original dimension. Image size reduced, original size: 1777 x 1399. Click here to view the image in its original dimension. Image size reduced, original size: 893 x 1399. Click here to view the image in its original dimension. Image size reduced, original size: 1812 x 1399. Click here to view the image in its original dimension. Image size reduced, original size: 2048 x 1421. Click here to view the image in its original dimension. Image size reduced, original size: 926 x 1413. Click here to view the image in its original dimension. Image size reduced, original size: 2006 x 1433. Click here to view the image in its original dimension. Image size reduced, original size: 2006 x 1425. Click here to view the image in its original dimension. Image size reduced, original size: 1045 x 1445. Click here to view the image in its original dimension. Image size reduced, original size: 1045 x 1413. Click here to view the image in its original dimension. Image size reduced, original size: 2096 x 1432. Click here to view the image in its original dimension. There's a new series called Bakuon about high school girls who are into motorcycles and form a motorcycle club at high school - it's sort of like K-ON but with bikes. Honda CB400SF Hyper VTEC Spec III. Satou also drives a red FD. And uses it to catch the crooks. Another episode later on mentions street racing and there's a flashback with a white S15 and someone driving an Impreza. The teams mentioned are the "Black Stars" and "Red Comets" so it's also a Gundam reference! 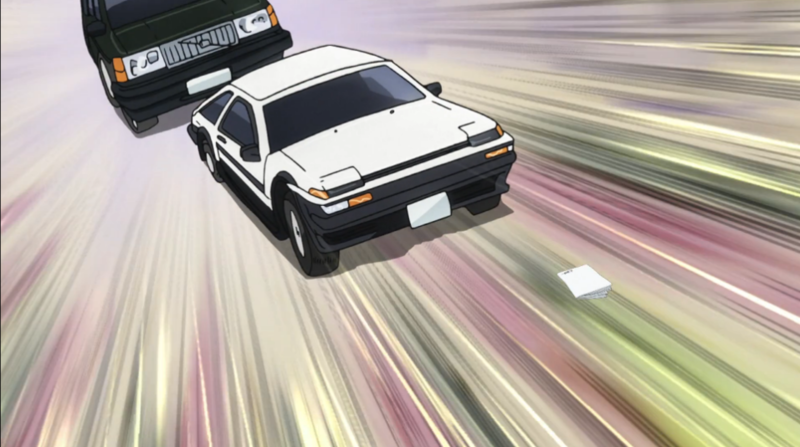 Coincidentally in an episode of Bakuon there is a flashback to a supporting character's past where they are at a bike meet on a mountain pass, and lo and behold, there is a parked Initial D-style AE86 (carbon fibre hood and all!) there. Later in the series a new character appears in the main cast (more on her later), who rides a Honda NSF100 on the circuit and although it's not a bike, but rather a scooter, she also drives a Honda PCX150 on the road. There are some other bikes that appear that are driven by the supporting cast which include: BMW K1300R, Honda CBR1000RR (I have a feeling this series is Honda-biased, not that I have anything against that) and a Suzuki 1135R Katana Yoshimura; also one of the cast gets her own bike which at first is a Honda Super Club until she learns to properly ride a bike and then gets a Ducati 1199 Panigale S that has been detuned to comply with Japanese regulations with regards to minors not being permitted to drive bikes with a higher displacement engine than 400cc. What's funny is at the time I posted the above I called it K-ON with bikes, and by the time I reached the end of the series just yesterday, that has been proved to be nearly 100% true. The main character, Hane, is a slightly ditzy girl whose 1-year younger sister is far more responsible and takes care of most chores, reminding me of Yui from K-ON, then there is Hijiri, a girl from a wealthy family, the slightly boyish Onsa, that reminds me of Ritsu, and as the story progresses to the main character's second year they recruit a first year student named Chisame NAKANO (even the same last name as Asuza!) that resembles K-ON's Asuza in appearance and also having a backstory where she comes from a family of talented individuals (in K-ON, Asuza's parents are musicians, in Bakuon her father is a former professional motorcyclist and her mother also rode motorcycles). The only K-ON analogue that is missing is Mio. 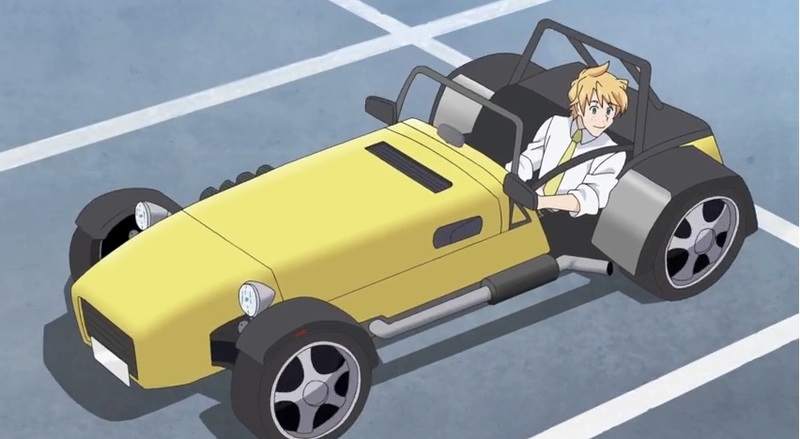 The main cast includes two other characters, Raimu-sempai (she's sort of like an ambiguous aged, version of the Stig in this series) and Rin (coincidentally their last names reflect their favourite motorcycle manufacturer, Kawasaki and Suzuki respectively), who aren't even remotely similar to the shy, easily embarrassed Mio. Nevertheless, it's a good series. Image size reduced, original size: 1928 x 1400. Click here to view the image in its original dimension. Guess what showed up in Jojo's Bizarre Adventure. Image size reduced, original size: 956 x 534. Click here to view the image in its original dimension. 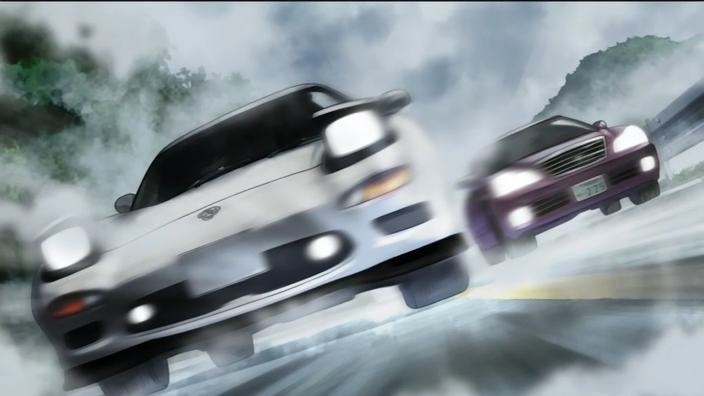 Late, but I'm surprised that you haven't mentioned Amuro's white FD3S. Image size reduced, original size: 707 x 462. Click here to view the image in its original dimension. It was involved in a T-bone collision in a case but it's mended. Also way late to this, but this is why I love Detective Conan.